With six seniors on the team, expectations coming into the season were very high. 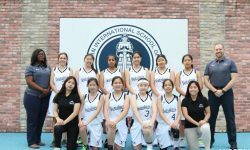 The 09-10 team made history by beating Seoul Foreign School twice during the regular season, earning a two week appearance in the Far-East top 10, finishing in a record 4th place in KAIAC division one, and winning 20 games for the first time in school history. Junior Forward Zsofi Lengyel broke Michelle Lee’s (’07) single-season record of 208 rebounds with 256 rebounds. Lengyel also became the all time leader in career rebounds with 459 followed by Youjin Her with 405. With a season ending injury to All-Conference player and captain Henie Nam, fellow senior Margaret Jang stepped into the point guard role. 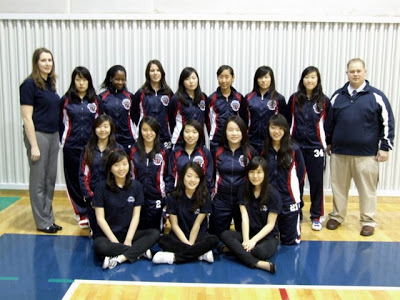 She broke Esther Oh’s (’08) single-season assist record and recorded 134 assists. Her effort earned her spots on both the Far East All-Tournament Team and the APAC All-Tournament Team.